I asked the pilot where we were bound. “Boulder Hut” he said. “Where’s that?” I queried. “Twelve minutes that way,” he said pointing west over Northstar Mountain. There are no baths or showers at Boulder Hut. Clean-up after a day of strenuous backcountry skiing involves soaping up in a wood-fired sauna, then dumping a bucket of water over one’s head. To my surprise a fellow guest, fit naked – and female – offered to do the pouring. I reluctantly acquiesced. Thereafter, the absence of a proper shower seemed trivial and I decided to forego my complaint to management. Rosie (indifferently) guards Boulder Hut. Management at this remote backcountry lodge consists of owners Mark and Sarah Yancey, whose infectious love of Boulder Hut – and the remote lifestyle it entails – is evident from the moment they greet you on the snow-packed heli-pad. Over the years I’ve acquired all the accoutrements for ski-touring – and on occasion I’ve skinned up from our condo on the Kimberley, BC ski hill – but I had never before toured in the backcountry. So I was curious when a helicopter touched down at the base of the ski hill on a sunny morning in January. A group of people, ski paraphernalia in tow, was preparing to board. I put down my coffee, stepped off the deck and wandered over. I asked the pilot where they were bound. “Twelve minutes that way,” he said pointing west over Northstar Mountain. As I ain’t gettin’ no younger, I determined to be on that chopper before the season ended. And so in mid-March I was soaring over our place, watching my wife Florence waving goodbye from our deck. I hoped it was not a permanent farewell. Moments later we were up and over the Black Forest on the ski hill’s back side. Then we were into the rugged roadless world of the Purcell Range. We hugged a ridge of wintry peaks, summited Boulder Pass and descended into a broad forested valley. A tiny dot far below soon resolved into Boulder Hut. After a welcoming lunch and safety briefing we strapped on skins and started our first ascent through the thick forest of old-growth spruce that provides Boulder’s gorgeous back-drop. The conditions were fabulous; a storm had just blown through. Fresh powder and sunny, bluebird conditions greeted us. Drinking water is drawn directly from a small creek that flows year-round. Every winter the media warns of avalanche danger in the backcountry. At Boulder Hut safety is paramount. With Mark and alpine guide Brent Peters constantly checking conditions – and leading the way through dicey areas – we felt safe and comfortable. When there was any hint of risk they dug a snow profile to check for stability and to ensure some rogue slab wouldn’t ruin our day. 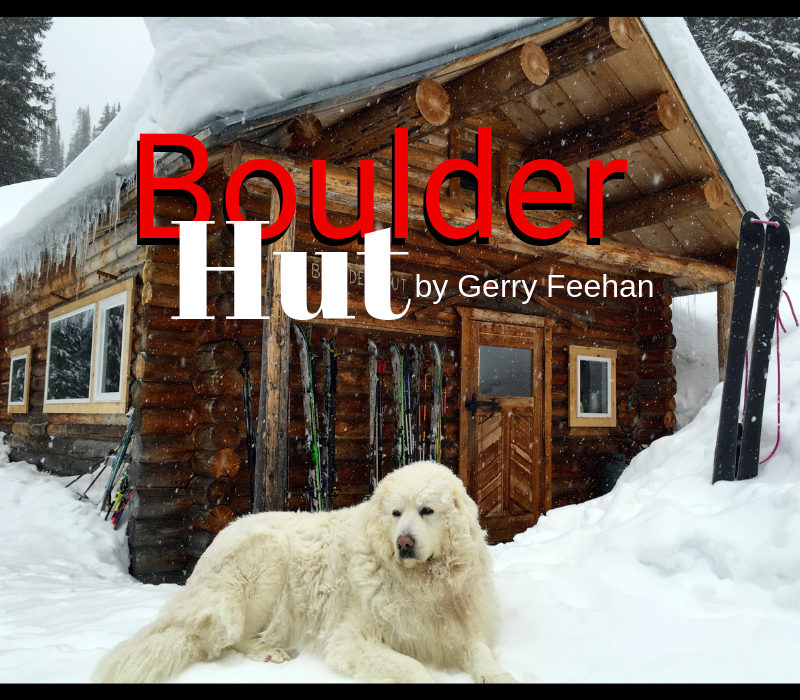 Boulder Hut is remote, quaint and rustic – guests share an open sleeping cabin. If you forget earplugs (and sleeping pills), your repose may be ruined; exhausted snoring skiers make a hell of a racket. In the evening guests are responsible for stoking the wood-burning stove. Failure to maintain the fire means for a long cold shivering night. As the only rookie, I was utterly exhausted at the end of each day and slept like a baby – with an assist from earplugs (and a little blue friend). Drinking water is drawn directly from a small creek that flows year-round. The same stream supplies power via a small hydroelectric plant. Boulder has no laundry facilities. By the fourth night my ski socks, hanging over the bunk to dry, had taken on a crisp flavourful bouquet – or so my fellow guests noted (I was obliviously comatose). Boulder’s bathrooms are located al fresco; open A-frame jobbies where one can enjoy a panoramic view of the Purcell Mountains whilst engaging in one’s morning constitutional. A sign planted in the snow announces whether the privy is occupied or available. At Boulder Hut there is no cellphone coverage or internet. And guests are (gasp) expected to help with the dishes after dinner. I’ve been to five-star ski lodges where a cat whisks you to the top of the mountain for each run. At Boulder Hut every turn is earned. Mark calculated that we climbed 14,000 feet (4300 meters) during our stay. Sound like a miserable experience? I had the time of my life. Mark, Sarah, their kids Grace and Alden, mascot Rosie the Great Pyrenees and my seven fascinating fellow guests made for a fabulous, unique experience. I’m going back to Boulder this winter – and taking along a few buddies – all rookies. Now if only I can arrange for a reprise of that fit lady with the water bucket. Click to read an excellent story about the Turks and Caicos. TORONTO — A spokesman for an organization representing Sri Lankan-Canadians says he has “no answers” in the wake of co-ordinated bomb attacks in his homeland that killed at least 207 people and injured 450 more. Riyaz Rauf, vice-president of the Canada Sri Lankan Association of Toronto, says he found out about the bombings via text messages from friends just after midnight. The federal government warned Canadians in Sri Lanka to limit their movements and obey local authorities, saying the situation in the country remains “volatile” and more attacks are possible. It added that the High Commission of Canada to Sri Lanka in the capital Colombo would be closed on Monday due to the security situation. Global Affairs Canada said in an email Sunday afternoon that there are no reports of any Canadian citizens being affected by the blasts, whose targets included hotels and a church frequented by tourists. Sri Lanka’s Foreign Ministry said the bodies of at least 27 foreigners were recovered, and the dead included people from Britain, the U.S., India, Portugal and Turkey. China’s Communist Party newspaper said two Chinese were killed. Prime Minister Justin Trudeau joined other world leaders in expressing sorrow and shock at the attacks, while condemning the targeting of worshippers on Easter Sunday. “Canada strongly condemns these heinous attacks on hotels and Christians at prayer in churches. Places of worship are sacred, where all should feel safe and secure. No one should be targeted because of their faith,” the prime minister said in a statement. Sri Lanka’s defence minister described the bombings as a terrorist attack by religious extremists and police said 13 suspects had been arrested, though there was no immediate claim of responsibility. Most of the blasts were believed to have been suicide attacks. Prime Minister Ranil Wickremesinghe said he feared the violence could trigger instability in Sri Lanka, a country of about 21 million people, and he vowed the government will “vest all necessary powers with the defence forces” to take action against those responsible. The government imposed a nationwide curfew from 6 p.m. to 6 a.m. The eight explosions represent the deadliest violence in the South Asian island country since a bloody civil war ended a decade ago. Rauf, who moved to Canada nine years ago, said he’s at a loss to explain the reasons behind the violence — but he’s confident his homeland will persevere. “There’s absolutely no reason — no cause, nothing — for something like this to be happening in this beautiful country,” he said. Amarnath Amarasingam, a postdoctoral fellow at the University of Waterloo who has authored several books and papers on Sri Lanka, said even in a country “brimming” with ethnic and religious conflict, no one expected an attack of this scale. Sri Lanka was dominated for decades by the sharp divide between the majority Sinhalese, who are overwhelmingly Buddhist, and the minority Tamil, who are Hindu, Muslim and Christian. The mistreatment of Tamils helped nurture the growth of armed separatists and led to nearly 30 years of civil war, with Tamil Tiger fighters eventually creating a de facto independent homeland in the country’s north until the group was crushed in a 2009 government offensive. More recently, Muslims, who make up roughly 10 per cent of the country’s population, have been targeted by violence fuelled by rumours spread over social media about attacks on Buddhists. In 2018, mobs of Buddhists swept through small towns, attacking mosques and Muslim-owned shops, prompting the government to briefly declare a state of emergency. Amarasingam said those tensions have lingered to some extent in Canada, which is home to roughly 150,000 people of Sri Lankan or mixed Sri Lankan descent, according to 2016 figures from Statistics Canada. A significant portion of that population are Muslims, he said, and he imagines many are concerned the attacks could lead to a flare up in anti-Muslim sentiment or even violence. Despite that, Rauf — who is Muslim — said he believes the community will also come together to support each other in this time of tragedy. “One thing good about the Sri Lankan community that has migrated to Canada is that when they migrated from Sri Lanka, few people brought their baggages, their way of thinking from back home,” said Rauf. “The new generations — the second generation and the third generation that have got used to living here — adopted the Canadian culture, understood the ethnic harmony here. They’re all united,” he said.